Leicestershire Guy Fawkes Night Round Up, is the best guide for when looking for local Bonfire Night events to all the best displays taking place this guy Fawkes night, no matter if you are keeping an annual tradition, or wanting to socialise, this list has all you need. To make it easy, we have added a Table of Contents – So you can quickly navigate to your local Leicestershire area. We have also added a change log, If at any point we take away or add an event, it will appear in that section. Venue: Woodhouse Rd, Quorn, Loughborough LE12 8AG, UK. What’s on Fireworks, Bonfire, Entertainment, food, drinks, Train Ride. Learn More: View Here about Quorn & Woodhouse Bonfire event. What’s on Fireworks, Bonfire, themed food, Halloween competition. Learn More: View Here about Melton Mowbray Halloween Bonfire event. Time: Gates open: 17:00 pm, 5 pm – 9 pm: Funfair and food stalls, 6 pm: Live Entertainment, 6.45 pm: Children’s fireworks, 7.20 pm: The High Trees, 8 pm: main fireworks. Venue: Abbey Park, Abbey Park Rd, Leicester LE4 5AQ, UK. What’s on: Fireworks, Bonfire, live entertainment, funfair, food stalls, Drinks. Price: Advance tickets: Adults £5, Concessions £3.50, Family £14 (two adults, two children), On the gate: Adults £7, Concessions £5 (no family tickets available on the gate). Learn More: View Here about Abbey Park Bonfire & Firework event. For a safe fun night at any of these Leicestershire Guy Fawkes Night Round Up 2018 Please follow the rules, as most displays do not allow to sell or buy fireworks or allow animals. Please take extra care if you are attending on your own, take extra money and a mobile phone for emergencies only. Did you enjoy this post? Please share it with your friends. Would you like more? 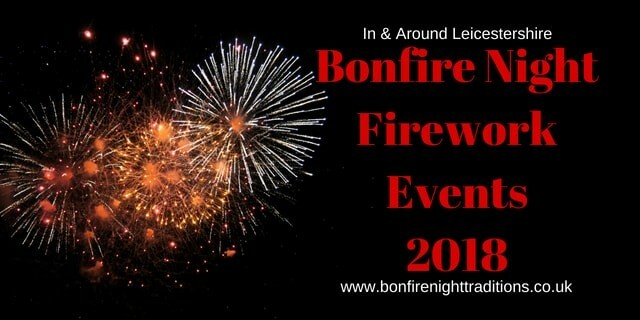 join us on the Bonfire Night Firework Displays in Leicestershire Facebook group. Where you can share all the latest Leicestershire events that are happening local to you.